With Pandemic ravaging the globe, Olivya’s psychic Sight compels her to see auras riddled with the colors of despair, and now her mother is infected. Olivya’s only hope is the mysterious Mikah, a powerful Empath who claims the Pandemic is linked to his clan, the Kindred, and their brooding, monstrous, Immortal Lord. But can she trust this boy who can manipulate her very emotions? 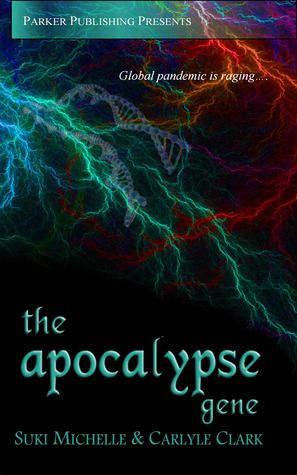 With Mikah’s aid, Olivya races to unearth Kindred secrets, desperate to find a cure, only to discover the Pandemic is far, far more than a mere disease . . .
Action-packed and dynamic, this novel is a total rush, with a rich world and a plenitude of spectacular ancient and yet fresh beings, filled with tension but also humor and a whole lotta funny (to me) slang! I very much so enjoyed the diversity of the environment the authors have built, and the element of originality that clearly permeates Suki Michelle and Carlyle Clark’s writing. The alert rhythm of action takes you on a journey through different worlds in a tale of struggle for survival. The rapid succession of active scenes and the constant stream of new information make this into a highly interesting read; each page immediately translates into a movie inside your mind, and the ease with which the authors bind storytelling and alert action with humor and imaginative twists and turns will have you spinning. In fact, at times I found it was a bit too alert, too tense, too on edge, my heart was constantly racing. There’s a bit of a love story, but it doesn’t go into soul-wrenching detail; neither do the violent scenes, in my opinion, making this a rather safe and creative urban YA fantasy. However, there was something that didn’t click all the way for me. Despite the fact I like crazy-fast action in animes, I find myself wishing for something a bit slower in novels; not snail-speed slower, but slightly more tranquil. This, of course, is a matter of purely personal taste. The haste, and in places frenzy, of the action gave me a strange sensation of detachment from the characters; I found myself wanting to go slower for a bit, to connect or reconnect with who the characters really were. All in all, I would enthusiastically recommend this to action-lovers and YA urban fantasy fans, it’s a fast paced refreshing read.